Check the pressure of each tyre, including the spare, every two weeks and before long journeys. The pressure should be checked with the tyre rested and cold. For the correct tyre inflation pressure, see “Wheels” in “Technical specifications” section. normal pressure: tread evenly worn. low pressure: tread particularly worn at the edges. high pressure: tread particularly worn in the centre. Tyres must be replaced when the tread wears down to 1,6 mm. In any case, comply with the laws in the country where the car is being driven. To allow even wear between the front and rear tyres, it is advisable to change them over every 10- 15 thousand kilometres, keeping them on the same side of the car so as to not reverse the direction of rotation. holding depends also on the correct tyre inflating pressure. low the tyre overheats and this can cause it serious damage. 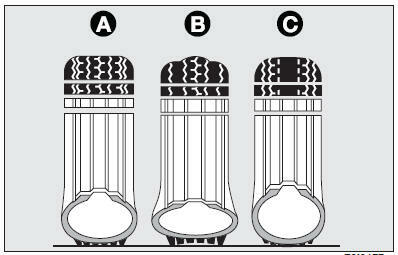 tyres, moving them from the right of the car to the left and vice versa. to repainting treatments requiring to use temperatures exceeding 150°C since the mechanical properties of the wheels could be impaired.